Contemporary Galleries is delighted to provide Fjords furniture to its brand offerings. Fjords, a family business, started in 1941 in the fjords community of Sykkylven, Norway. Fjords modern designs have been inspired by the nature & the history of Norway, along with ancient traditions. Today they have grown to become a leading furniture manufacturer in Norway. 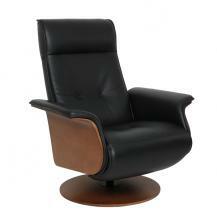 Fjords recliners use modern technology to suit your body's need for ergonomics & the need for rest & movement. They are designed to provide a full body support when upright or reclined depending on your individual resting position. Features like adjustable neck support, two different sizes to fit your build better, springs in the seat & back for additional support & cold cured moulded foam for durability. All of their recliners are available in a beautiful color palette along with different grades of leather for an abundance of options to fit your home decor. Comfort is not a luxury, it is essential to your health & general well-being!